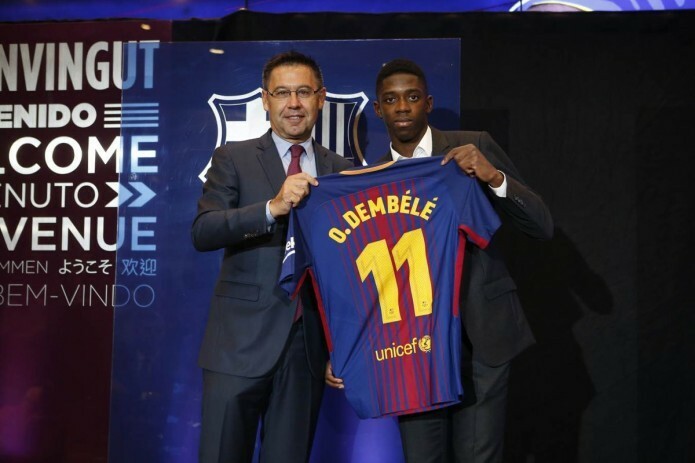 Dembele unveiled as a player of "Barcelona"
Barcelona unvelied on Monday (August 28) its record signing Ousmane Dembele who will give the team the attacking presence they lost by selling Neymar to Paris St Germain, coach Ernesto Valverde has said. Barca and Borussia Dortmund agreed a fee of 105 million euros (96.86 million pounds) plus bonuses on Friday (August 25) after being locked in negotiations for weeks, during which time the player was suspended by his club after failing to report for training. The France international, 20, is Barca's second signing since the departure of Neymar for a world-record fee of 222 million euros in August, with Brazil midfielder Paulinho also joining. Valverde believes Dembele will restore sharpness to his side's attack.